Ten a.m. and the Wednesday market in Agen is lively enough with turn of the season produce that begs winter to leave and spring to arrive. Plum trees are wearing new white frocks all across the Garonne River Valley, yet this morning I lit a fire in the cheminée to take the chill off of the old stone bones of Camont. By the time I return from the market, the doors are flung open as two young pups run road races through the open doors. Living in Southwest France is living in an audio cookbook. A recipe here, a ‘truc’ there, and after 19 years later, I have accumulated a repertoire of very traditional and very personal recipes. This week, direct from the mouth of Marthe Delon, renowned Kiki trainer and long time truffle cook at the Lion d’Or in Lalbenque, a Lapin aux Truffes recipe- a straightforward braised rabbit in white wine perfumed at the last minute with a handful of sliced truffles. Back on the Gascon ranch, it was delicious simple recipe prepared with a meaty farm raised rabbit from the Wednesday market at Le Passage. The next day, I made it my own by transforming the leftover rabbit, truffled sauce and puréed potatoes into a sort of shepherd’s pie. I think Marthe and Kiki would have approved. Remove the meat from a leftover braised rabbit which was cooked with thyme, bay, white wine, leeks, and carrots, salt, pepper and truffles. Transfer the liquid from above braise into a bowl. Make a basic light béchamel sauce (butter, flour, milk). Add the rabbit meat and braising liquid to the béchamel and heat together over a low flame. Season as needed. In the meantime, take 2-3 cups leftover pureed potatoes, separate 2 eggs- add the yolks, salt and pepper, nutmeg and more truffles to the potatoes. Whip the whites fairly stiff and fold into the puree mixture. When meat and sauce are hot, pour into a ovenproof dish ( I used a cassoulet bowl) and top with the potato puree. Place in hot oven (around 425’F/250’C) until potatoes have souffléd slightly and turned golden brown. Serve hot with a nice winter salad of bitter greens dressed with a sharp vinegar dressing and glass of chilled Cote de Gascogne. The town fills fast with cars with license plates that end in 24, 01, 31, 33, 47—the numbers of the French departments. 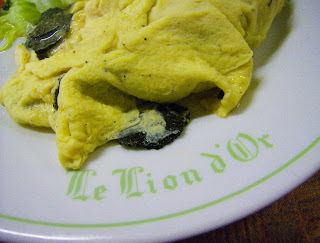 We head straight to the Café Le Lion d’Or to score a table—oops, already too late. ‘No reservation? Sorry.’ Impossible, I think, as I spy a space at the bar. “Ok. Merci. Come on, Pim, let’s have a drink.” But before we have gotten our glass of Vin de Noix and a heaping plate of pistachios, the manager returns, shrugs over his shoulders and gestures to an empty table behind us. I think it was the big camera* that Pim slung onto the bar. Café? no time. the crowds are moving. The café begins to empty. The street is filling. 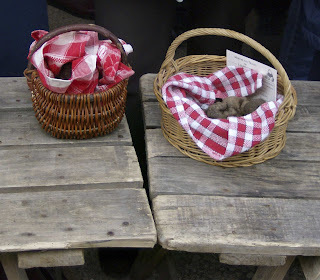 Little Red-Ridinghood baskets are appearing. The energy increases as does the sound level floating in from the opening doors. Without waiting for the waiter, I head back to the bar to pay. No truffle is going to escape my nose. I quickly lose Pim in the crowd—a sea of black berets, flat caps and winter coats swallows her and her big camera. The players take their places behind the knee high bench tables. A blue cord is strung down the street to keep the spectators back until the Marché aux Truffes de Lalbenque officially opens at 2:30 pm. Dealers, chefs, négociants and tourists mingle elbowing in for a better look, sniff, haggle. This is as close to dealing on the street that I’ll probably ever get. 400€uros per kilo for the middle quality, less for brumales—the herby smelling less valued tubers, then up to 850€ per kilo for premium top grade Tuber Melanosporum. One of our lunch neighbors turned out to be Bernard Planche, a walnut merchant who also makes a truffle-scented shampoo and massage oil. Everyone here seems slightly truffle mad. Sticking as close as a Pig to her truffle, I followed Bernard down the line as he chatted with his favorite merchants, the one who catches grives and becasse for him, the one who brings 20 kilos of brumales suitable for making Moutarde aux Truffes and other pungent aphrodisiac products. 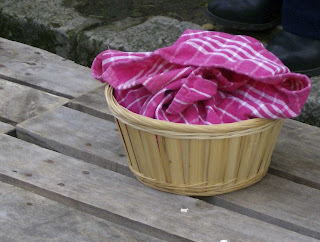 The baskets are small, modest, lined with an old hankerchief, a calender tea towel, a chiffon of a red-checked tablecloth. With B.P.’s help, I buy a small basket full of dizzyingly ripe truffles- two walnut sized of good quality, two large brumales and a small moldering little nugget not worthy to train a pig, let alone Bacon. 50 Euros. 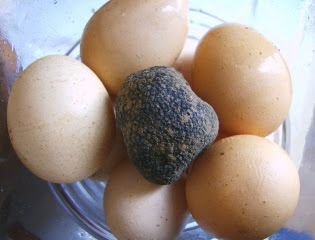 After returning home, we agree the comparison of the real truffle and the brumales is a lesson well learned. For more truffle baskets treasures check out ChezPim. The car smells like truffle, the kitchen smells like truffle, I smell like truffle. 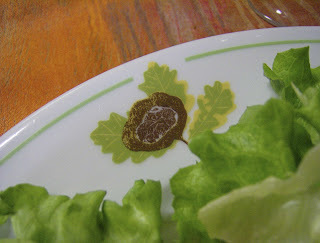 We eat a simple omelette for lunch and make Marthe Delon’s Lapin aux Truffes for dinner. It's enough. I rarely need to leave my beloved Gascony for gastronomic amusement. But when I whispered the word "truffe" during our Winter Gathering Weekend, Pim changed her train ticket and agreed to yet another adventure. Just to north of the Garonne River Valley begins the vast limestone plateau and hills of the Quercy. This is the home to black-eyed lambs, fat walnuts, Cahors wine and those little herbacious goat cheese called cabécou. This is also the destination for those seekers of black diamonds- les truffes. The little Clio goes fast. In an hour and half, after a speedy drive up the Autoroute from Montauban, we were spit out onto a country road surrounded by a scrubby truffle oak forest in it's winter brown cloak. We had arrived at this portal to Quercy where poor soil and rude climate conditions create the perfect terroir for tuber melanosporum-- the black diamond. 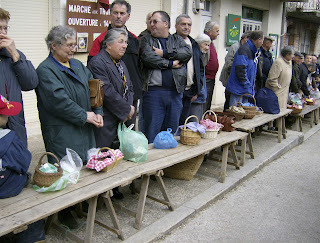 Destination- Lalbenque and its famous Marché aux Truffes. This is what we bought. Not when dinner for twelve is four hours away and the Saturday Market lunch has stretched into a lazy afternoon as we drive the Gascon hills. Not when Chinese New Year's dinner for twelve is two hours away and we have Lucy’s dumplings to make, Pim’s rice, my own spiced pork belly to braise. I promised a winter gathering, a New Year's piggy feast and the little house with a big French Kitchen is filling quickly with cooks and friends. Hungry friends. The Nerac market is my magnet. It draws me each week- rain, fog or sun- to talk and buy, taste and bavarder*. It’s not a big market, an hour would do to shop, but these are old friends of many such Saturdays. It takes time to kiss cheeks and exchange news. First I buy ducks feet for soup, boudin de canard and terrine from Patricia; Lucy V. and Pim T. click away. They start to wander off driven by the textures and bustle of the late morning but I call them back to meet Jean-Claude and taste the rich Laguiole and Salers cheese that he drives down every week from the Auvergne. 250 grams of each in the basket. David and Sue know my slow ways and stick close to sample and meet my clan of market vendors. 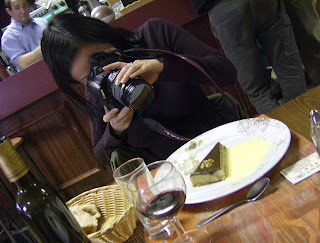 But food bloggers are loathe to miss a shot or a new opportunity so as I ping back and forth, down the umbrella-ed aisle exchanging euros for food, chatter for information and filling the baskets for dinner. There are 12 mouths to feed. I stay overlong Chez Kakou as two large bone-in hams catch my eye. “What’s a coche?” I ask and twenty minutes later, duly informed and having sampled the jambon de cochon- the ham made from a young pig- 12-18 months old versus the Jambon de Coche- much larger, deeper red with a thick white band of solid fat, we walk away with two large slices of this special ham made from an old sow- the equivalent of a stewing hen to a fryer. Cabbage shoots, little grey shallots, leeks- big and small, two dense loves of rye bread, a sausage, pain d’epice, soy bean sprouts, water cress, prunes, oranges, and fresh eggs later…baskets distended, handles cutting into palms, we arrive at Chez Chapolard, artisan butchers, where we buy a pig’s heart, a 3-kilo piece of pork belly and are given a pound of merguez and an invitation to dinner. Then a quick charcuterie lesson to taste. I now know the difference between saucisse seche and saucisson. Ask me nicely and one day I’ll tell you. After an improvised studio visit with Franny and a pique-nique in her kitchen, we return to Camont to cook and cook and cook. 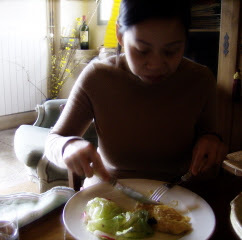 As fat as a new year’s pig, my French Kitchen grew and grew until under the new moon it spilled into ‘Café Camont’ where we ate and drank to winter foods, long life, new friends--and old. The Year of the Pig, Cochon & Charcuterie begins. Long live these too many cooks. A peasant becomes fond of his pig and is glad to salt away its pork. the two statements are connected by an and not by a but. Exactly a year and a month ago, I used this quote above when Judy Witt and I began our research for an IACP seminar we began posting on Going Whole Hog. I return to 'the peasant and his pig' this weekend, when friends and colleagues arrive in my French Kitchen to celebrate the beginning of the Year of the Pig. Today Pim is bringing her ambulatory blog with her, Lucy is arriving with half of Lyon tucked in her basket, and Franny is showing up with her winter paintings. Saturday morning the market at Nerac will be dissected and divided into our baskets. Saturday night the Gascon Gang arrives for dinner- a dozen festive souls for a chinoiserie. Sunday, after the fat market, there are ducks to confit and foie gras to be preserved. Tuesday truffles call for the last of the yearly markets at Lalbenque. Then up the little country lane, my neighbors will be slaughtering the last pig next weekend. February is busy in this hive of good food production. 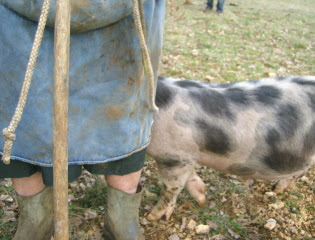 Like that peasant, I have become fond of my pig earth and glad to salt it away. For those interesting in joining me in Southwest France, I am starting cooking sessions on March 5 in cooking and curing- Potager. Pantry. Plate. Email for further information. As Spring waits to pounce into blossoms across the Garonne Valley,these first sunny days herald another seasonal ritual--scrubbing the Winter crud out of the nautical nooks and crannies. this is part of the 'romance' of living on an old dutch barge. This Pirate Captain's best friend, rather than the customary ham*, is a brand new West Marine bright-blue soft-bristled scrub-brush with an extra long handle. Sigh. No more scratching the hand painted finish, no more bendy over back ache. I almost growled with pleasure as I leapt** to the top of the wheelhouse and attacked the winter green bits. In my landlubber life I cook, teach and write about the great Gascon gastronomy; On huckfinn days I play at being a Pirate Queen afloat on the French inland seas. (One doesn't get seasick that way.) It's not a bad life if a little quiet. But every salty Captain worthy of her ration of armagnac has an indispensable first mate. And although gone but not forgotten, H.P.DuPont has a worthy heir - Bacon de Barici. Short on table manners and just a little too independent, at three months he has already mastered walking the gangplank and jumping down the companion way stairs. His fancy name not withstanding, he is not from Noble blood like DuPont. Bacon de Barici harks from the Chapolard Pig Farm and has a different sort of pedigree- he can tell his jambon from his jamon. Very important on a pirate ship. He asked me what was the best part about being a Pirate Queen. The Booty? The Silver, Pearls and Gold Doubloons? The Swagger? The Adventures? "No, my wee little matey. Just now, the best part of being a pirate is... the naps." And so, after scrubbing the decks, filling the water tanks, curling the 100 foot-long hose, and putting my well-worn crocodile deck shoes away, It's time for a little Pirate snooze. Arrr, me heart-ies, there's more to life than cooking and doing dishes. This summer we'll be raising the 'Joli Rouge' for some hi-jinks on the inland seas. Stayed tuned...after the naps of course. ** Leap here is used as a synonym for "crawling rather ungracefully up to the roof with the aid fo the scrub brush". or fine gold threads from a bale of straw. This yarn is woven with guts and blood and a gnawing hunger. This is a pig's tale. Next weekend a few special friends join me in Gascony to celebrate the beginning of The Year of the Pig and a year of cochon & charcuterie in the French Kitchen. This winter gathering, born out of a desire to share the table, promises to light a dark moon night with chinese lanterns and tall tales. What will we cook? Who will be there? What stories will be told? Time to chase the dark demons of winter away and make room for Spring. On Saturday night, in one small corner of the Gascon countrside, there will be fireworks and lanterns, laughter and music enough. And food; don't forget the food. Pork belly, spareribs, dumplings, and boudin. Ham, pate, saucisse and crunchy pork cheeks. Will 20 people be enough to eat it all? How many bottles of wine? How many glasses of armagnac? Long after the crowds have gone... there will be talk. 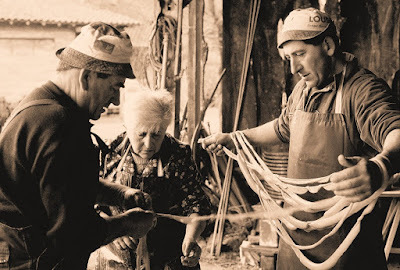 Stories and tales to weave through the night; enough yarns spun to make a colorful sweater for the great mother sow as she hovers over the house with 'the ladle' in hand. And THAT is how history is made. Start with an idea. Make a plan. There is a Chinese proverb for these occasions- Those who say it cannot be done should not interrupt the person doing it. These grey days. Heart and soul. Gascon sky. Winter’s gloomy end. To banish the habitual February blues, we cook. We invite friends to eat. 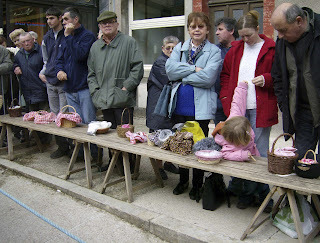 Inspired by her invocation to focus, to celebrate the simplistic choices, and find inspiration at hand, I remember this photograph I took at the winter marché au gras at Samatan. After the overdose of duck, duck, goose…and their delicate livers- the soup. She is inspiration—for a winter soup, a satisfying gratin, a rich garbure. Of course, I bought it all. The cabbage, the squash, the snowy bunch of turnips, shallots and garlic. My money in her hand, Madame could now go home, certainly back to her own warm kitchen as I would return to mine. Five simple winter icons=a wonderful winter meal. No recipe is necessary. But this is what I did. Cabbage- chop in large wedges. Blanch in salted water then drain. Squash- peel and seed, cut into ice cube-sized pieces. Turnips- cut off tops and wash, then slice finely (chiffonade); peel and quarter the roots. All the shallots and one head Garlic- peel and leave cloves whole. In the bottom of a heavy pot that has a tight fitting lid, melt two tablespoons of duck fat (remember we were at the foie gras market!). Then in layers, place the squash cubes, the cabbage wedges, and the turnip roots and greens. Stud the shallots and garlic cloves into the vegetables. Salt, pepper, and add two bay leaf and some thyme- winter aromatics. Just enough good water (no chlorinated tap water please) to barely cover the vegetables. (Think of it as a very court bouillion.) DO NOT STIR! Shake the pan gently for time to time when cooking. Simmer on medium high heat until it is steaming nicely (15-20 minutes), then lower heat and cook slowly until all the vegetables are fork tender and easily crushed. A Gascon farmwife would have stuck in a leg of duck confit, an old ham bone, a fist full of white beans. You can, too. Or cook some thick-sliced bacon as an afterthought and place it on top of the vegetables to soften and enriche the pot likker. This is the winter garden in the ...pot. My own Potager* lies sleeping under a cover of fallen weeds and composting hay and manure from the neighboring farm. The Gascon mud, clay thick and slippery, demands patience until late April; once dry enough to plant it rewards the pantry with a fertile vengeance. In the meantime, these winter months, I forage for some leftover roquette, a few straggler leeks, and enough mint to make a ‘Gascon julep’- an armagnac hot toddy with mint and honey. What a good idea, as warm and soul comforting as soup. Eat the vegetables for lunch; drink the julep for afternoon tea. *The french word Potager refers to the soup cook who also tended the vegetable garden for said soup or potage. Home…one of those good four letter words. I often remind myself that besides my own double-barreled foursome, some of my favorite words are as easy as 1 2 3…4. A French friend once asked me about why our English ‘four letter’ words were so dangerously close to other words. I had told him that shut and fork were just a matter of clear pronunciation. I reminded Olivier who rode a moto, sculpted bois, and liked to eat foie gras that there were more interesting four-letter words than the ones shouted by heavy metal music groups- the source of most of his English vocabulary. Tonight, in the jet-lagged, full moon four-lettered February night I type the best quatre-lettres word I know—h o m e.
Home after three months and several thousand miles of travel, multiple spare beds, dinners with friends, playing in strange kitchens, and eating as many corn tortillas as one person is allowed to eat in that time. What wonderful times with good friends and family as we celebrated again and again, from NYC to Portland to San Luis Obispo “an excuse to be together”. Home by car, train, plane to a quiet boat on a canal in France. Twenty-nine hours of travel. Bad planning for a pro. Home to a winter beautiful garden where hand-sculpted roses and hedges are revealed in the beacon night light. The French garden fairy has been by recently. Home is a green water canal so clear that today as I check the propeller, the bottom reveals a bottle of unopened vodka that tumbled off the gangplank one summer- the seal lies unbroken. The boat is stone cold but warms quickly until the last of the furnace fuel exhales a gassy breath and goes quiet. The full moon assists a flashlight as I search for the mischievous short circuit that is jumping the electricity off. Ahhh, life in the country; never easy, always something to do. Home, here, is so quiet that it echoes off the old stone walls that welcome my bags of insignificant gifts that I ferried from airport to airport. What was I thinking? That the Fahrenheit oven thermometer would make me feel cozier than the cheminee? That the Trader Joe’s insulated shopping bag would be so chic at the Nerac market? I was too long a member of that consumer society to say no. I’ll unpack the rest tomorrow. I arrived home, here to Camont, last night at 8pm with a cheese sandwich from the bakery in Brax bought on the way from the train station; Tony and Margaret picked me up in Agen and helped unload the impossibly heavy suitcases then gently left me to soak in the silence of the country night. I found one bottle of wine made by friends tucked under the counter. It is delicious, French and sells for just 4 Euros. And although Saint Marie-Rose had stopped by and cranked the heat up today, it takes a small fire to warm this winter soul. The wood is damp but it burns bright. I eat the sandwich next to the flames; I warm the wine in my hands. My first French meal home. My inner clock is so turned around that now at 2:30 in the morning, I realize I am napping at bedtime and sleeping at naptime. Who cares? The first days rediscovering the joys of home will smooth the circadian rhythms to a Gascon pace. By Saturday, I’ll be up early enough to go to the market, fill the Trader Joe's bag, stock the French Kitchen pantry and begin to walk the towpath with Bacon looking for stories of my French Kitchen home. Cooking classes start soon. Winter food first-- confit and cassoulet. Food that takes time to cook and allows writing in between stirring the pots. 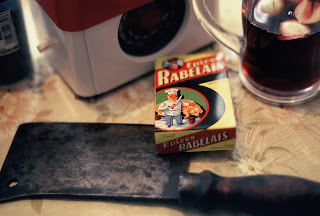 Winter is a good time to get to know the food of my Gascon home. Wednesday afternoon, when the kids are out of school, the big kids will be learning and cooking in new series of French Kitchen Adventures- A Gascon ABC: a French Kitchen Primer. This is all about three more four-letter words-- Cook Good Food.